Apparantly it is possible to fit a turbo engine into a beetle, but which engine is the best? are the porsche engines the easiest to put in? If I walked up to you and said this to you, would you know exactly what I am talking about? Now maybe you put the project information in the "Introduction" section but it would also be helpful here so we knew exactly what you were doing. ive just bought a vw beetle and want to do up the car i have plans for the rest of the car but the main problem i have at the moment is that i want to put a turbo engine in the car and dnt know which engine would be the best. 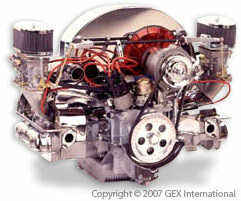 i have been told that porsche engines are the easiest to put in but dont know how true this is. An older Porsche engine (from 60's and 70's) would be the easiest since the Beetle and Porsche back then were close to the same. My dad had a friend who awhile back put a Porsche engine into a Beetle (wrecked the Porsche), apparently it was fast (the car) and easy (the swap). They make a VW turbo Beetle....just get an engine out of one of those. If you're talking an older air cooled Beetle, then you ned to talk to Bernie Bergmann Enterprises, as they make a LOT of different turbo engine combinations for those cars, as well as turbo kits. But to be honest, you don't need a turbo engine to go fast. Just build up a 2110 or 2180cc N/A bug motor. Relatively cheap and capable of propelling a Bug to 11-13 second quarter mile times, depending on buildup. Even a 13 second street Bug feels like a rocketship. If you do that, don't forget to upgrade the trans, as well. Companies like TransForm have warrantied high performance transaxles for failry low prices, and you'll need the SuperDiff option to keep from blowing up the transaxle with a big Bug engine. The nice thing about a bug engine is you don't need to create a cooling system and route hoses up to a front radiator. It's just a bolt in thing. I'd stay away from using an early Porsche engine. The 356 stuff is almost identical to a Bug, but it costs vastly more and has less potential. The 911 stuff is pricey and heavy, even the early 2 liter engines, in comparison to a bug engine, and it sticks farther back (which isn't what you want in a Bug). The only "Porsche" engine really to consider in a bug swap is the VW Porsche Type 4, as found in the 914 and 912E (and the VW 411/412 and later Type II Busses). It'll bolt in, but you need to change the cooling tin to fit. They start out larger, however, with a 2 liter avaialble. You can start with a 1.8 or 2 liter Type 4 and build up to 2.7 liters in streetable form (and over 3 liters in race form). It's more expensive than a Type 1 Bug engine, but it's the way to go to get 10 second N/A street Bug times. Go pick up a copy of Hot VWs magazine and start perusing the advertisers. You'll find more info and cool ideas than you ever thought possible. Is there another kind? Or did you just mean compared to the new beetles? >>>Real Name:Josh, 13 years old. Slipknot had mentioned teh turbocharged New Beetles, and that's a transverse engine, FWD car which makes the swap very hard, so I wanted to be clear that we were discussing the old ones, not the New Beetles. Chris, what kind of engine were you using in the Beetles you had? The car in question is a 1970 beetle. "But to be honest, you don't need a turbo engine to go fast. Just build up a 2110 or 2180cc N/A bug motor. Relatively cheap and capable of propelling a Bug to 11-13 second quarter mile times, depending on buildup. Even a 13 second street Bug feels like a rocketship." So how do you build up a 2110 or 2180cc bug motor? Simple answer, start with a 1500 or 1600cc air cooled Bug engine (stock or aftermarket), get the case machined to fit the larger cylinders (remember, on the air cooled VW engines, the cylinders are not an integral part of the engine block and can be swapped out for larger ones), and fit them. Utilize a new, longer stroke crank. Use the later dual port heads, machined out to fit the new cylinders and pistons. Add a good cam, and either dual carbs or fuel injection. Lastly, a quality exhaust is needed. There's a bit more to it than that if you get into the details. but that's the concept.